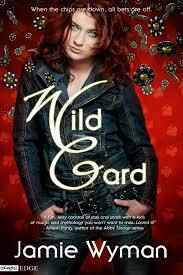 We here on the Sofa are excited to introduce you to Jamie Wyman, whose urban fantasy WILD CARD comes out November 25 from Entangled! In a Las Vegas that’s overrun by gods, Cat Sharp learns that her boss, the Greek goddess Eris, is running an all-trickster-god poker game—and Cat’s soul is Eris’s latest ante. With the help of the sarcastic satyr Marius, Cat might be able to get her soul back. If the two of them can survive the night. Why Las Vegas? I wanted to do something set in a major American city that already existed and had a sort of mythology all its own. Chicago belongs to Jim Butcher’s Harry Dresden. New Orleans is Lestat/Sookie Stackhouse territory. And New York is all over the place. When I thought about the story seed—Gods playing poker—it became clear that I had to do Vegas. The more I thought about it, the better choice Sin City became. Not only is it famous, it has its own personality, so many personal stories attached to it. It’s got a fantastic history including the Mob and Elvis. The population is rather transient and everything there is constantly moving. If someone gets stuck there, it’s more likely to make their life hell…which is precisely how I wanted the audience to meet Cat Sharp. Where did Marius come from? I jokingly say that Marius has 3 daddies. The character came to me while I was working on plotting out enemies and allies Cat could deal with. I knew I wanted a satyr, and I wanted him to have a wicked wit. He sprang up in my head almost fully formed. He didn’t have a name yet, but he had a voice, and a basic look. The voice and face belonged to Jason Carter, an actor who played Marcus Cole on the 90s sci-fi show Babylon 5. So as a kind of homage to Carter’s portrayal, I took the name “Marcus” and changed it to “Marius” to give my satyr some Old World mystique and charm. So, not long after I started writing the rough draft, the Huffington Post ran a story about the Fright Night remake with a picture of David Tennant in this long wig and goatee. My jaw dropped. The picture they ran *was* Marius (except he had these tattoos that weren’t quite right). Facially, though. BAM! Nailed it. Marius’s third papa is…my husband, Sean. It might sound corny at first, but seriously. Physically there is some resemblance to the way I’ve written Marius. Well, to be more accurate, my husband strongly resembles Jason Carter. And he does a dead on impression of Carter’s voice. When I was writing the rough draft, I told Sean about a particular scene and what I wanted Marius to do. Sean put on his Jason Carter voice and just started going. He really *got* Marius and nailed exactly what Marius would say. So some lines in the book are straight from my husband’s mouth because they were just so in character. Who are your favorite urban fantasy writers? I love Jim Butcher. “The Dresden Files” series is one of my favorites. Also dig on Lilith Saintcrow (her “Dante Valentine” books are great), Charlaine Harris (True Blood), Allison Pang (The Abby Sinclair series). And I know not a lot of people consider him to be urban fantasy, but Christopher Moore. Sure, he’s not writing a lot of the genre tropes and his books are full of humor, but I think he fits the bill. He’s definitely one of my inspirations. Thank you Jamie! And congratulations on great reviews on Goodreads! Jamie can be found on Twitter at @beegirlblue, her blog, and on Facebook (as Jamie Wyman).